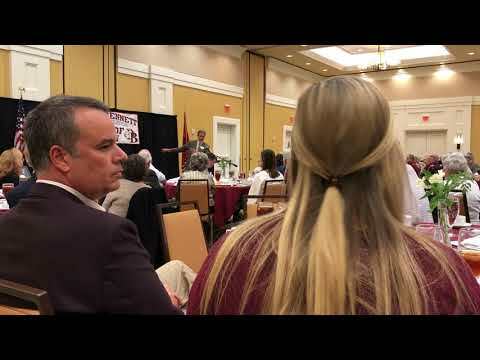 KINGSPORT — Folks told stories of athletic prowess, business acumen, childhood fights, pool and poker playing, a famous friend, near-death experiences and childhood sweethearts becoming life-long loves at the 10th annual Dobyns-Bennett High School Alumni Hall of Fame induction Thursday. Six D-B graduates were inducted into the D-B Alumni Association Hall of Fame, which started in 2009 and Thursday grew to 65 members total. The event was at the MeadowView Marriott Conference Resort & Convention Center. Identical twins Dan and Dennis Westmoreland grew up in Kingsport and went on to become radiologists doing research in diagnostic radiology, as recounted by presenter Earl Lovelace, a Class of 1963 classmate and former principal of D-B already inducted into the hall. Lovelace remembered both were left-handed and would lengthen baseball practice from the batting cage. “They would never swing at a bad pitch, even in batting practice,” Lovelace recalled. Dan, slightly older than his brother, said he was the worst D-B class president ever because classmates would have to pull him away from poker games in Five Points or from a pool hall. He also worked for the father of fellow 2018 inductee Hal P. McHorris, Class of 1958. In addition, he recalled he and a friend on the way back home from squirrel hunting overturned a car at the sluice and being only a tree away from sinking, prompting a man who came by to say the two were living on borrowed time. “I guess I’ll have to follow Dan,” Dennis Westmoreland quipped, adding that he “popped out” four minutes after his older brother. After the ceremony, Alderman Tommy Olterman recalled seeing one of the brothers playing pool and going cold with all his shots. After a trip to the bathroom, his playing got much better, but years later the two admitted to Olterman they changed shirts and the other brother finished and won the game. Dr. Sam McCord presented his grandfather, Class of 1958 inductee Michael O. O’Neill, recalling that O’Neill grew up in Greenfield Acres after his parents moved to discourage O’Neill’s imaginary friend, Bill. Instructed to meet new people, O’Neill as a second-grader introduced himself to Hal P. McHorris, also Class of 1958 and an inductee Thursday. McHorris promptly punched O’Neill in the face. “I started crying and went home,” O’Neill said. “Not known to them (the parents) Bill came along. We just hide,” O’Neill said, adding that D-B “became a way of life” for his family with three children and six grandchildren graduating from there and a 3-year-old one and 6-week-old one headed there. “We have been incredibly blessed to have our roots in this place, and I will never leave,” O’Neill said. Past hall inductee Dickie Warren said that inductee C. Wallace Ketron Jr., Class of 1953, has “held every position they had” at the Kingsport Community Church where he attends. The two were in the same class and were teammates in football and baseball at D-B and football at East Tennessee State College, now East Tennessee State University. The two went on to long careers in education and coaching, with Ketron’s culminating in being elected Sullivan County superintendent of schools, leading the largest school system in Northeast Tennessee. “Everything he was involved in, he made better,” Warren said, adding it was hard to believe this was the “same guy we walked down the street kicking a tin can with his bibbed overalls on.” Ketron was nicknamed “Punchy” from his days as a boxer. “Any time you box, they always call you punchy,” Ketron said, saying he was honored to coach and teach at Church Hill High School early in his career under football coach Jay Salley. “I couldn’t believe I was being paid for what I loved to do so much,” Ketron said of being paid $268 a month in 1958. He later was principal at Gate City High School and then taught at D-B before going to Sullivan County and also worked in Florida school systems. As superintendent, he said he tried to follow the example of former Kingsport Superintendent Ross N. Robinson who visited the schools so students would know him and always sent birthday cards to all school employees, including janitors and cafeteria workers. “They are important because they’re part of our school system,” Ketron said. College friend Tom Haskins presented inductee Hal P. McHorris, who was an All American in 1961 when playing football for Emory & Henry College and made Sports Illustrated that same year with his sweetheart, now wife of 56 years, after a game with Washington & Lee University. She had transferred from the University of Tennessee to E&H before her parents knew. An Eastman employee, he was at one time manager of recreation, similar to his dad’s position as director of parks and recreation for the City of Kingsport. McHorris is active at First Broad Street United Methodist Church, the UMC’s Holston Conference and its college, president of the E&H Alumni Association, chairman of the Senior Golf League and at 78 has a U.S. Golf Association handicap of 4, recently shooting a 64 in Elizabethton or 8 under par. McHorris presented his brother for induction last year. “It’s a great place to find a spouse,” McHorris said of Kingsport City Schools and D-B, saying he met a “red-haired girl” name Clara Cox in 1952 and married her in 1962. Michael Ainslie presented for William B. Greene, a Class of 1955 graduate who at 24 became the youngest bank president and CEO in the nation. After a long careering in banking, including the co-founding of the Bank of Tennessee, he was inducted into the Tennessee Banking Hall of Fame. Ainslie said Greene today is part of the Hole in the Wall Gang, an informal group leading the charge for regionalism in Northeast Tennessee and Southwest Virginia and that pushed for the merger of Wellmont Health System and Mountain States Health Alliance into Ballad Health. “We all know Bill as a banker and athlete,” said Ainslie, a past inductee into the hall. But at Wake Forest University, one of his best friends needed help passing Spanish and Greene urged him to play golf on the South American tournament circuit as a way to pick up Spanish. Instead, the friend disregarded that advice and played the U.S. amateur tournament circuit, planning to win and make money, prompting Greene to say the friend will “amount to nothing and not make any money” without a college degree. The friend was Arnold Palmer, a life-long friend who proved Greene wrong.